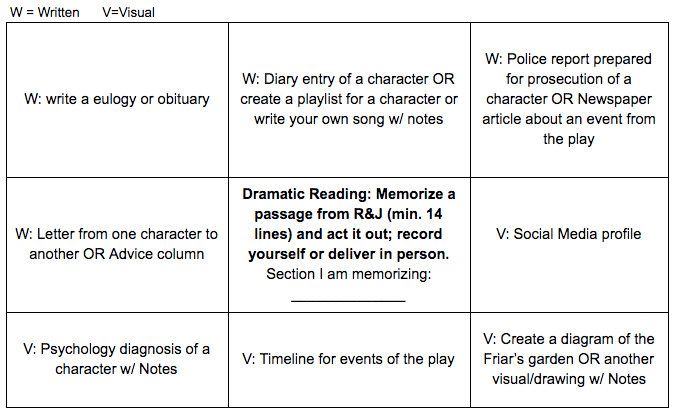 One of the summative projects for my freshman English 9 Romeo and Juliet unit is a “Tic-tac-toe” project. They get a checkerboard of 9 options and they draw a line through the middle, each producing a visual, written, and performance component. It’s an easy creative project that generally yields fun results during the last week before spring break. Since I am enjoying grading them, I thought I would share some student work with my readers. 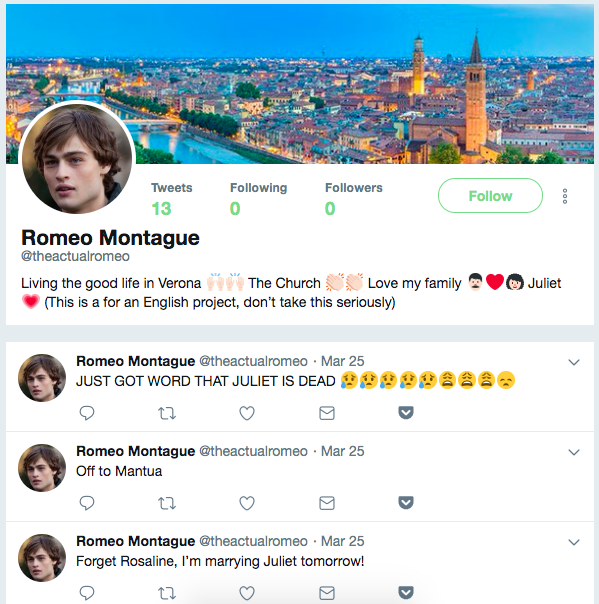 I may have edited for some readability and a few missing capitals, but in general these are authentic interpretations of Romeo and Juliet, according to freshmen. Enjoy some terrible advice columnists, sappy diary entries, creative timelines, and Romeo killing Count Paris the gummy bear. Every student has to do a dramatic reading from the play, but they have more control over the visual and written elements. The written portions are generally between 250-400 words, and must include 2 direct quotes from the play. I met the guy of my dreams last night, but it turns out he is a Montague, and I am a Capulet. A little bit of a backstory is that the Montagues and Capulets have had an ancient grudge, and my parents would be furious if they found out about my feelings for him. When we first met, we started talking about pilgrims and saints and he goes, “O, then, dear saint, let lips do what hands do.” He already wanted to kiss me! So that must mean he really feels the same way about me. We ended up kissing later on in the night (multiple times), and it was amazing. I thought that he was moving forward too fast to actually be in a serious relationship, and I wanted to see if he was committed, so I said, “If that thy bent of love be honorable, thy purpose marriage, send me word tomorrow.” , and he said yes! Do you think we are doing things too quickly? No, I don’t think you’re moving too fast at all! It’s good that you want to make sure that he’s committed and serious about this relationship. The fact he said yes means that he wants to be with you forever and not just temporarily. About the family feud, if your parents don’t accept your love for each other, then just run away to another city! You shouldn’t run away from your problems, but if it’s for love, go ahead and do it. I hope this helps! During this sad time, I want to give and share all the amazing memories I had experienced with Mercutio. He has been such a delight, but also a pain sometimes. Every time I was down or didn’t feel up to a task he was always there to make me feel better, and not sit around. He didn’t quite believe in dreams, or my meaning of dreams, and thought they were all stupid and nonsense. He would make fun of them like saying they are “Begot of nothing but vain fantasy (I,4,98).” Now that I think about that it might have been true because look at all of this tragedy. He helped me with my love life, in a way, because he didn’t believe in true love. His version of love was basically saying it was weakness, his reason is true to me now because love is the reason he is dead. Mercutio saying “If love be blind, love cannot hit the mark (II,1,33),” is just a saying of truth. I know that Mercutio’s death was my fault, I am the one that got in the way, and I am very ashamed how I didn’t act quicker with Tybalt. I want his name to pass on and to not be forgotten, bless you Mercutio and may you Rest In Peace. This creative young lady used post-it notes to give her more space on her timeline. I am always impressed at how kids manage to use their ipads when I can’t figure out how to even take notes on mine. This song is for Romeo. This relates to Romeo in the sense of how they each felt a fast connection when they saw each other. An example from the song is the line, “Somewhere in her smile she knows that I don’t need no other lover.” This is for Romeo because he’s finally realizing he doesn’t need Rosaline and he can have Juliet as the love he truly wants. It also tells him where his heart should be completely and that is with Juliet. For this visual option, students took Fr. Laurence’s monologue from Act II to create a hypothetical diagram of his flower and herb garden. 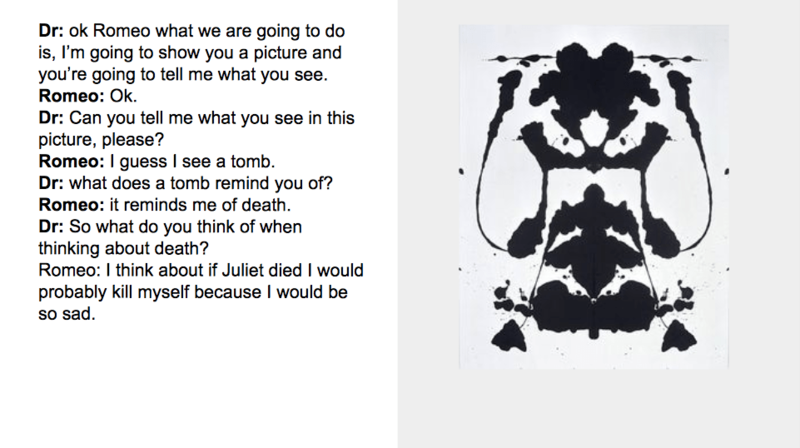 Students chose a character and created an inkblot test for them, then “diagnosed” their psychological condition with a treatment plan. This idea was borrowed from another multi-genre project from another teacher. The part EVERYONE has to do is perform a minimum of 14 lines from the play. In the past I have had them memorize it, but given the short time we had they could choose to read them an only lose a few points. The goal is to learn to read iambic pentameter smoothly and seriously. Some worked very hard to memorize, some recorded themselves awkwardly reading it, and some, like this young man, attempted a more creative interpretation. Pretty much all of them were entertaining in some way from a teacher standpoint. On my Teacher Pay Teacher Store!